Time is money. If you are not able to quickly make the right moves based on timely, accurate financial information, then you will lose your position in the marketplace to those companies who can. 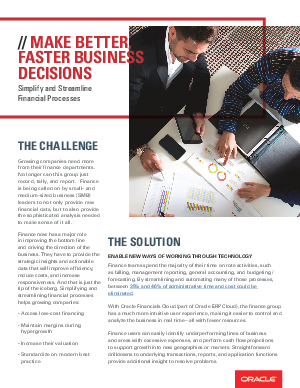 Download this guide to see how to simplify and streamline financial processes in order to identify underperforming lines of business, perform accurate cash flow projects, support expansion into new markets, and much more.